Dominic, Anna and their parents live on the fifth floor of an apartment building. Over their apartment is the flat roof, on which a little room or garret has been built. The family use it as a store room where old things, paintings and other objects are put, including trunks containing clothes worn by great grandfather Mitsos and great grandmother Annitsa. Dominic usually goes up to the garret to play Game Boy and Anna goes mainly to try on their great grandmother’s clothes; she had been an actress and was known to have been a very elegant woman. The only other person who ever goes up there is Anna’s friend Orestes, a boy with the disposition of a poet. According to Dominic, Anna and Orestes are in love, and shut themselves up in the garret to “whisper sweet nothings”. All the strange events begin when Anna decides to have a masquerade party at Carnival time. After discussions about who was going to dress up as what, Orestes came up with the best idea: that they should all dress up as ladies and gentlemen of the good old days. Orestes and Anna decided to dress up as a couple whose baby would be Dominic. The garret would supply them with everything they needed. They even found an elaborate rattle that had belonged to Grandpa Mitsos, which poor Dominic was going to have to hold. However after much complaining on her brother’s part, Anna told him he could dress as a Mexican. And while all this was taking place, Grandma Annitsa and Grandpa Mitsos look on from the garret and keep up a lively commentary. Grandpa Mitsos was especially concerned about his rattle. The party was a great success, and everybody had a lovely time; the only fly in the ointment was that the precious rattle had disappeared. After much discussion and searching all over the house (which Grandma Annitsa with her legendary absent-mindedness had left in such terrible shape that everybody thought they were going mad) the two “ghosts” decided to reveal themselves to their great grandchildren and help them find the rattle. Their investigations eventually led them to a classmate of Anna’s named Vrasidas, who spends all his time in a sleazy coffee shop. There, after a boisterous fight in which Dominic, Orestes and Anna took part, as did the two ghosts, they learn that he has exchanged the rattle for a lighter at the shop called Bazaar that belongs to a friend of his. The three children, Grandma Annitsa and Grandpa Mitsos all troop town to the shop where, after yet another quarrel, they regain the precious rattle. And as everybody slips back into the routine of their life (including the great grandparents), after an episodic and rainy winter, spring creeps gently into Athens. Manos Kondoleon, Ghosts in the garret, Patakis Editions (Dove Collection No. 48 for children from 11 years of age and older) 139 pages. Drs. 1500. The most recent young people’s novel by Manos Kondoleon is an adventure tale with a lot of humour that takes place in contemporary Athens with three children as protagonists. But behind its entertaining facade, the story talks about issues that affect many children between the ages of nine and 14 years old, as are our heroes, Anna, her younger brother Dominic and her friend Richard. The children frequently go up to the little garret on the terrace roof of the apartment building in which Anna and Dominic live. The old trunks in the garret are full of treasures: old photographs, from which great Grandpa Mitsos and great Grandma Annitsa look out, family heirlooms and old-fashioned clothes. The plot centres around the effort to find an antique rattle (which had been rescued, along with other treasures, from the fire that destroyed Smyrna) that the children had found among other forgotten things. They admired it. “‘Wonderful,’ he said almost to himself as he stroked its white bone and curved ribs and the finely worked angel on the delicate edge of the old toy. ‘A very elegant piece!’ smiled Richard.” (p. 45). But the rattle was mysteriously lost at a masquerade party organised by the children, who dressed up in their great grandparents’ clothes. Mitsos and Annitsa, however, circulate among the children like spirits and play a leading part in the story as two lovable ghosts. Reconciliation with death is an underlying dimension of this story, which bridges generations, reinforces the need for memory and suggests that children see the other dimensions of the same thing. As one of the heroes in this story, Manos Kondoleon has brought back Dominic and his sarcastic remarks; he may possibly play a leading role in other adventures. The book has the advantage of a very attractive cover, designed by Vangelis Pavlidis, one of our best illustrators. Athens, Patakis, 1996 , 144 pages. 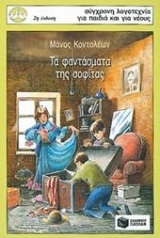 Manos Kondoleon is perhaps the only Greek author of books for children and young adults whose every work contains surprises for the reader, as well as for the literary scholar. Because, among other things, he raises theoretical issues that touch upon questions relating to theories about Reading and the Reader. Here, elements of intertextuality from his earlier work (the interchange of heroes, situations) act as subsidiary elements dictating a different attitude that has to do with broadening the readers’ expectations horizon. In this novel, he touches the metaphysical issues raised by questions about life after death. In a happy atmosphere, a brother and sister encounter their dead great grandparents in their garret, and these ancestors then accompany and protect them. 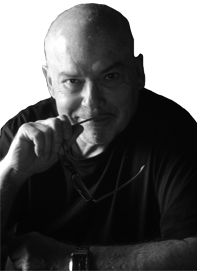 Humour, one of the author’s stylistic characteristics, is slipped in appropriately, maintains the necessary textual and emotional balances, within the context of coming to terms with metaphysical issues. [“With zero and eternity we must be reconciled” as Karyotakis once wrote.] And this is how a fundamental, admittedly difficult subject can be approached in a relaxed, natural and even gentle way, by an important author. Among other things, could it not also be an “answer” to some of the books being marketed recently, such as unacceptable horror books for children? For children of 10-11 years old. Dominic and his family live in an apartment building, on the top, fifth floor. Right over their apartment is the flat roof in the corner of which a little room has been built. This little room, something like a storeroom, belongs to the apartment on the fifth floor, which may be why Dominic and his sister Anna call it “our garret”. They use it as a kind of attic. It has shelves with books on them, some forgotten paintings, a couple of old upholstered armchairs covered in frayed red material, a small TV table, two or three table lamps and some trunks with old clothes and other equally old objects: suits, dresses, skirts and blouses left from the war, hats from the prewar period, baby items belonging to Grandpa Mitsos, boxes containing dog-eared yellow snapshots, Grandma Annitsa’s wedding dress and other such objects. Oh yes! And there’s an old full-length mirror, without a frame, leaning against the wall by the window; but nobody can remember how it got there. The only people who ever go up to the garret are Dominic and Anna. Dominic sneaks up whenever he wants to play his Game Boy without everybody telling him he’s ruining his eyes, and Anna goes when she has the urge to dress up in her great grandmother’s old clothes. Grandma Annitsa used to be a theatre actress, so she loved richly decorated, exotic dresses. Most of her clothes had either been taken by her daughter-in-law or distant cousins, or were lost in the various family moves. The clothes that survived are today kept in a trunk in the garret and Anna puts them on whenever she wants to transform herself, her brother and her girlfriends from people of the present to characters of the past. When Dominic goes up to the garret, mainly on Saturday afternoon or Sunday morning, he’s usually alone and in search of the peace and quiet required to devote himself to the demands of Game Boy . Anna, on the other hand, prefers to have company when she closes the door to the garret, usually one of her girlfriends, but lately that of Orestes too. In fact, Orestes is the only boy (except of course for Dominic) who has gone up to the garret. And this is not only because he’s a close friend of Anna’s, but also because he himself likes being there. Now that Orestes’s grown up, he has stopped daydreaming at all times of the day, but the habit has been transformed into another. He’s become a romantic youth who likes to read poetry and listen to flute music. “He’s a weirdie,” remarks Dominic but Anna rushes to her friend’s defence. “Orestes is going to be a poet. He is already! Almost,” she answers, perhaps implying that Orestes is always working on some poem. The fact is that nobody can say with certainty what Anna and Orestes do up in the garret, that is Dominic cannot say with certainty. His sister declares that in the garret she and Orestes look through old photographs, look at or try on old clothes and listen to little flute compositions from the tape recorder. Dominic suspects they are up to other things. “Come on! Those two are in love and lock themselves in there so they can kiss and say soppy words to each other!” he argues, but nobody wants to believe him. The garret has a window that looks out over the road, and when it is open, lets the sunlight in to brighten the dark-coloured trunks and the old books. There is also a naked bulb hanging from the ceiling. They turn it on on winter afternoons when the sun is about to hide its light behind the mountain or behind some heavy rain clouds. The same lamp could brighten the garret even when night has fallen. But nobody, neither Dominic, Anna nor Orestes, has stayed in the garret all night. It may just have happened, or it may be out of fear. In any event, old things behave strangely when the hands of the clock approach midnight. So this bulb is not used very often which is why it has been hanging there for years and has a thick layer of dust on the top part of it. But the dust on the light bulb is not as important as the fact that, since nobody has ever stayed overnight in the garret, no one, not Dominic, nor Anna and certainly not Orestes, has heard the strange, extraordinary noises that sometimes emanate from the little room on the terrace. These are noises that some people might compare to muffled laughter; others perhaps might think they were whisperings, while yet others might claim that they were hearing somebody crying softly. And there are even people who would say that what they heard reminded them of old songs sung by two voices, a man’s voice and a woman’s voice, softly singing forgotten melodies with lyrics describing a great love for women wearing long skirts and feathered hats, and men with wide ties, straw hats and black-and-white shoes. All this was happening in the living room of the apartment on the fifth floor; it was almost midnight on the night it snowed. And at that same moment, just three metres above, inside the garret, there was no radiator, nor even a little oil heater to temper the cold. But the intense cold did not seem to bother either Grandma Annitsa or Grandpa Mitsos. Seated in the dark in the two armchairs, they glanced over the surrounding terraces which were covered in white. “It snowed!” said Grandma Annitsa. “And what do we care if it snowed?” snapped Grandpa Mitsos. “And just as well, too, because you were always cold, and you would have suffered. Apart from the fact that you would have wanted to plant your frozen feet on me when we were in bed!” Grandpa Mitsos was not in a very good mood that night. “Oh, I see. Now we’re airing all our complaints, are we, madam Annitsa?” Was Grandpa Mitsos heading for a quarrel or could he have been working up to one of his little jokes? “That particular song was never one of your greatest hits, so why on earth do you want us to sing it?” asked Grandpa Mitsos and then got up from his armchair. He stood in front of the mirror. No image appeared on its stained surface. “It’s the rattle,” Grandpa Mitsos’s voice fell to a whisper, as though he was embarrassed at what he was saying. “Aha! So that’s what’s been bothering you,” Grandma Annitsa also got up from her armchair and stood beside her husband in front of the mirror. “The most unpleasant, perhaps even the only unpleasant aspect of our present state, is that you can’t ever see yourself in the mirror!” she murmured and instinctively smoothed over some imaginary wrinkle in her dress. It didn’t seem that Grandpa Mitsos wanted to comment on his wife’s last remark. He had remembered his earlier problem. “You know how important that rattle is to me!” he said. Yes, she knew. Her husband’s mother had brought it all the way from Smyrna. And ever since then it had been something like a family good-luck charm. She had given it to her granddaughter, who in turn had bestowed it on her son. Grandpa Mitsos’s rattle was the symbol of both the lost homeland and the love of the family: it was a family heirloom. Grandma Annitsa nodded her head silently. She thought: “But children today aren’t concerned about old family heirlooms. They are interested in technology.” She wasn’t very happy about this fact either, but she was by nature – and human nature doesn’t change, however much the person may grow old, even if he or she has died and become a ghost who has chosen to spend the rest of eternity in the upper room of an apartment building – a person who could easily adapt to something new. Besides, how can you resist evolution? “What are you talking about? Should someone in your state be speaking like that?” Grandma Annitsa was almost annoyed. Some things just had to be respected! “I mean it!” he said. Outside the snow had stopped falling. The sleeping city was trying to find a little warmth. That afternoon, Orestes returned the rattle. Anna looked at her watch. “I’m coming with you!” He couldn’t imagine being absent from the restoration ceremony! And that’s how Orestes the Chicken-hearted ceased to exist and his name went back to being plain Orestes. “Of course! You’re practically entitled to!” Our little sister is being rather overgenerous here, Dominic thought. The fact is that when they went into the garret this time, Dominic was the first; Anna followed holding the rattle; and tagging along behind, with a lot of hesitation (and fear, Dominic wanted to add) was Orestes. Well. I suppose one shouldn’t be so absolute. After all, it’s one thing to be weird enough to go in and out of a garret with ghosts in it, and another thing to do it for the first time (after finding out who lives in there). In the garret was a ray of late afternoon sunlight and a slight fragrance – that well-known scent that reminded them of Grandma Annitsa’s night cream. Anna approached the box, Dominic opened it. Grandpa Mitsos’s baby clothes always had the colour of old gold. And now, the ivory rattle lay on top of them once again. Everything was in its place: the clothes, the memories, the feelings. Orestes had stayed near the door. “Well, I don’t know whether this whole story tired you out, but I have to confess that I enjoyed it!” the voice of Grandpa Mitsos was heard. “Is that any way to talk to your great grandfather?” Anna berated him. “You’re as bad as your great grandmother!” Could that have been the sound of Grandpa Mitsos laughing? And Anna bit her tongue. “But she’s inherited my grace, stubbornness and strong character. I have bequeathed my voice to you... my little Dominic,” Grandma Annitsa is so sweet. Up to that moment, Orestes had been listening silently but at the same time feeling rather peculiar. He didn’t know where to look when he heard the voices. You see nobody had told him who was using the two armchairs. Dominic had a hard time restraining himself from letting out a shout of triumph. He’d figured out how to find out what Anna and Orestes were doing in the garret. Grandpa Mitsos would tell him! But not now. Another time. He’s in no rush. Now that he’d found them, he had no intention of losing them. Orestes turned red as a beet. He imagined Grandma Annitsa saying that not only does he read poems beautifully, but he writes equally beautiful ones. Then beets would pale by comparison! “Come as often as you want and whenever you want. Don’t be afraid of disturbing us. We may prefer nighttime conversation, but what grandparents would not sacrifice their sleep to hear their grandchildren singing?” said Grandma Annitsa. “Hmmmmph. That’s the way you always were! It took you a while to get into a good mood, but when you did, you never knew where your jokes should stop! Let the children go now, because they’ve got homework to do,” Grandma Annitsa seemed to want this particular discussion closed. “It wasn’t that we spoke to you, but that you heard us talking,” replied Grandpa Mitsos. “Each person hears what they are ready to hear,” added Grandma Annitsa. Dominic confessed – to himself – that he didn’t really understand these answers. Should they tell their parents or not? But Orestes and Anna did not seem to have this problem. They nodded their heads – but what on earth had they understood? “Good night, then”, Anna opened the door. “Good night to you,” Orestes was always the gentleman. “About the Game Boy , it’s a deal,” Dominic made the date. In the garret, quiet reigned once more. “Are you satisfied?” asked Grandma Annitsa. “Are you happy?” asked Grandpa Mitsos. That night, spring came and settled down definitively in the Athens sky. March presented its happiest face.